In 2015 a lady from Colorado, Carole Agne, purchased an early print of mine at a Goodwill Store in Colorado Springs. She located me on the Internet and learned that the print had a value far greater than what she paid. Carole became interested in my art, bought more of my prints and eventually an oil painting, “Dawn’s Early Light” directly from me. We had many conversations during this period and she relayed a fond memory from her youth when she, her mother and sister vacationed at the famous Grand Hotel on Mackinac Island on the upper peninsular of Michigan. Carole asked me to create a painting that would capture that visit and this is the result of the project. 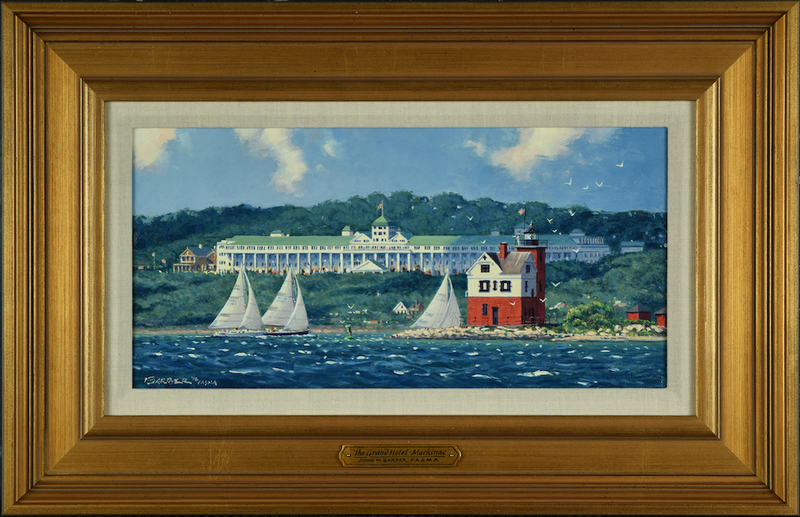 “The Grand Hotel – Mackinac” shows the magnificent resort on a bright, breezy summer day while a sailboat race takes place in the Straits of Mackinac between Mackinac Island and Round Island with its famous red and white lighthouse. On the upper deck we can see the lighthouse keeper waving the racers on. The cloth he waves is symbolic of a guest towel from the hotel that Carole still treasures as a memento of her visit. It has been a great pleasure working with Carole on this project and I hope that she and her family will enjoy these paintings for many years. The painting is oil on linen canvas: 8” x 16”. Overall framed size: 14 ¾” x 22 ¾” and was delivered with a hand-lettered, gold gilt nameplate and complimentary House of Troy painting light. 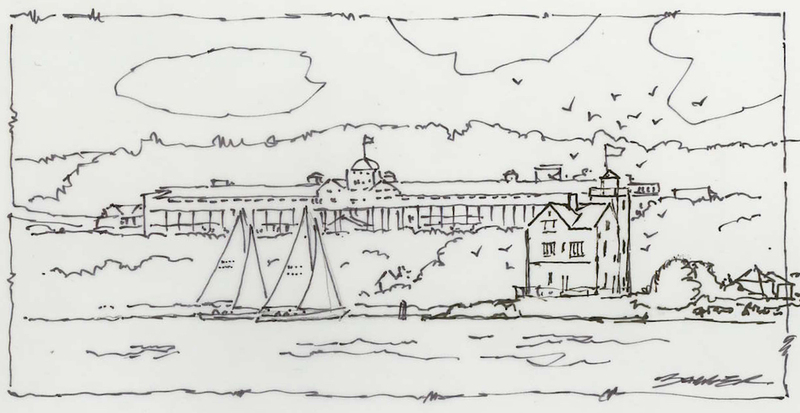 Below you will see the initial pen sketch that was approved by the client.